#Blab is a great platform, tons of fun and I think it will stick around! I have had the enjoyment this past weekend to participate in a couple #Blab sessions. 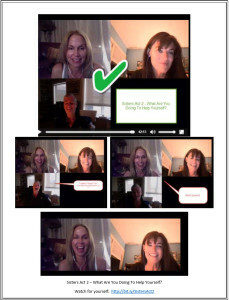 On Saturday night, Erika James and I hosted a Blab session for women’s self-improvement ideas and sharing. We managed the software fairly seamlessly and you wouldn’t have guessed it was our first session. We ended up staying for an extra hour, as I have noticed seems to be the norm on #Blab.im. Recording can be stopped and started as the host’s whim, so the final recording doesn’t have to be long and boring. The #Blab sessions bring community to people from all over the globe and those interested in discussing topics. I feel like I made a bunch of new networking connections and some real potential friendships. I joined a private Facebook group. I even have a couple leads to follow up on that could materialize into business. Blab.im is a vehicle which can be utilized to discover people who are interested in a particular subject. Everyone (most users currently are internet marketers and small business/sole proprietors) is talking about how it can be used for businesses. The possibilities are many! I don’t anticipate Blab.im is going to bring money directly (right away), but it will be a gateway for future clients to find the businesses with which they want to work. Thus far, I have seen it used as a public-oriented conversation steering interested and appropriate people to a private Facebook group where more personal sharing, support, and growth can happen. Many companies can host Facebook support groups (if they don’t already) which can be oriented geographically specific (local) or non-geographically identified. I am personally using it as a platform to talk about a #4Q15Goals Challenge I will be facilitating and finding more people to join in the challenge. I am finding new connections on Blab and steering them to my Facebook group and my Meetup group for the challenge. I predict this social media platform will grow fast and stick around. It is like sitting in a coffee shop and allowing people, who are interested in the discussion topic or just interested in talking, join your conversation. These sessions can be recorded or not. Recordings can be saved and downloaded in audio and/or video. There is also a link to put the recordings on YouTube. Blab can be used on desktop, iOS and Android. One of the major, positive aspects of Blab.im is the personal connection available very quickly. Most media that are live streaming result in one person broadcasting and others listening. Or, with the use of video, like YouTube, there is no immediate interaction. In Blab.im, real human connections are being formed like crazy! There is a lot of potential for this social media platform. I am having a blast with it already!